Hi! 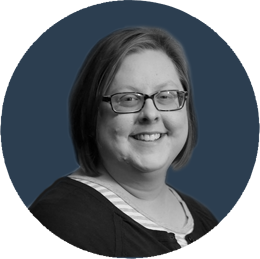 I'm Emily Ristow, the Loyalty and Engagement News Director for the Milwaukee Journal Sentinel. I oversee the Journal Sentinel's strategy in increasing our loyal audience and growing our number of digital subscribers. I coach journalists on audience-focused thinking, social listening and digital storytelling techniques. I lead the newsroom's efforts in promoting subscription campaigns. And I work across the enterprise to make sure our best content is being seen by potential subscribers. I also oversee the newsroom's engagement strategy across digital platforms, including our sites, apps and social media accounts. 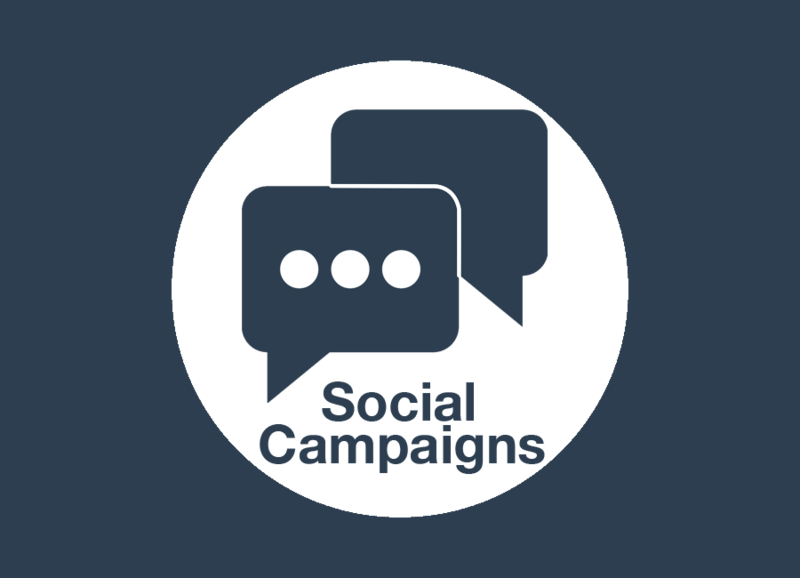 I developed our social media strategy and help post to our flagship accounts on Facebook, Twitter and Instagram, creating social media campaigns for our biggest projects. Under my direction, we grew our Facebook reach by six times in a year, which you can read about here or listen to me talk about here. 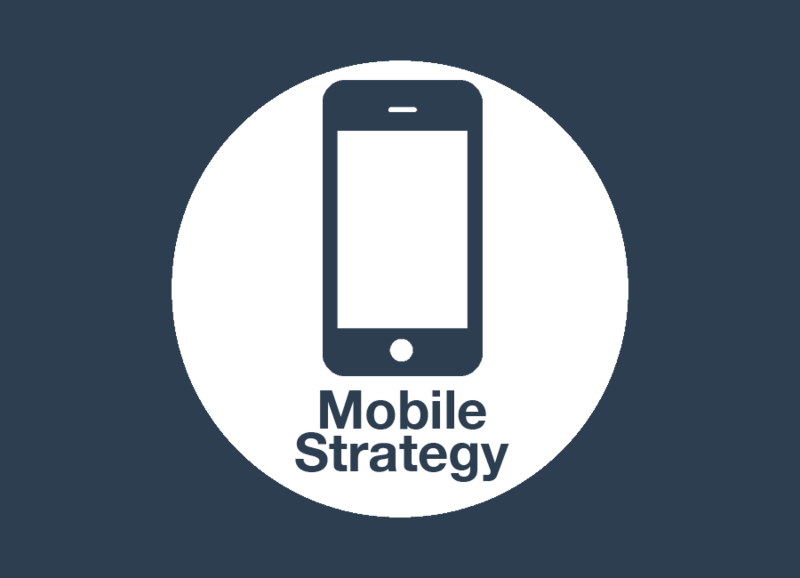 I also set and execute our mobile strategy, writing many of our push alerts. Previously, I was a digital producer and copy editor, where I was responsible for editing stories and photo galleries, packaging digital elements and related content, and managing the homepage and section fronts. I've also worked as an assigning editor and print designer. 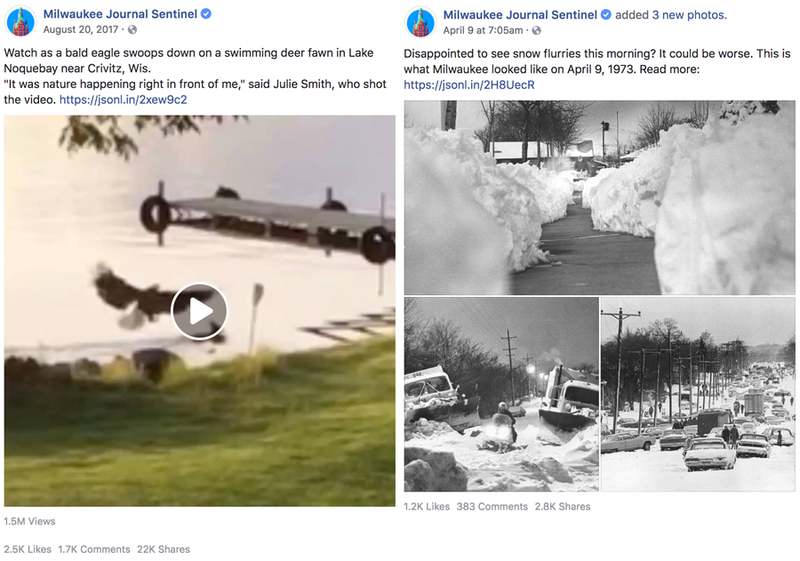 Through the social strategy I developed, the Journal Sentinel was able to nearly double its Facebook followers in a year. The strategy extended beyond expectations and best practices for Facebook, Twitter and Instagram to include the creation of content specifically for audiences on those social platforms. One example of this was our "Up North" project. 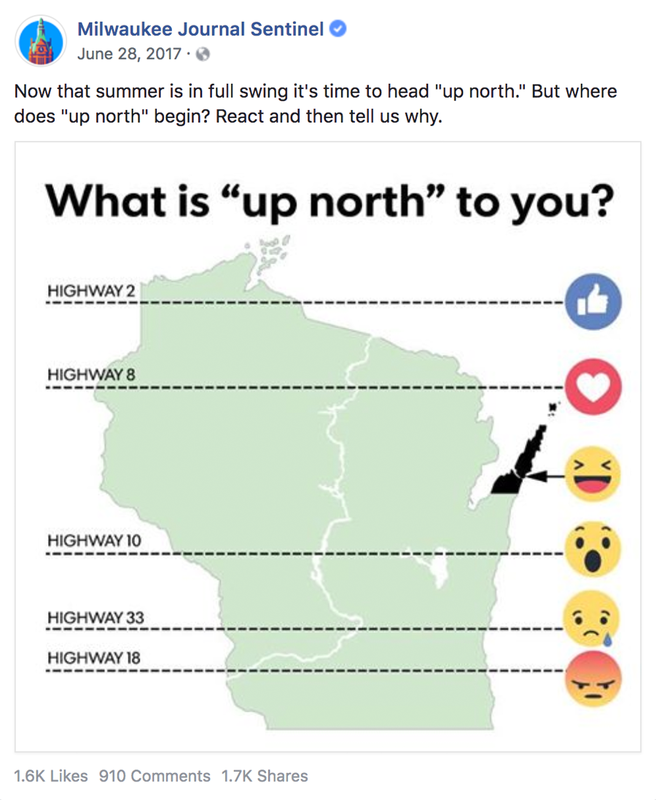 It began as a Facebook-only poll, encouraging people to react and comment on where they think "up north" in Wisconsin begins. That poll became our most popular non-video Facebook post ever. The best comments on the poll were then pulled together into a written story. The popularity of the "up north" poll continued to grow over the next couple of weeks. So I recruited our development team to create an interactive map that let people draw the line exactly where they wanted "up north" to begin. The interactive proved to be a big success on our website and when it was shared on social media. 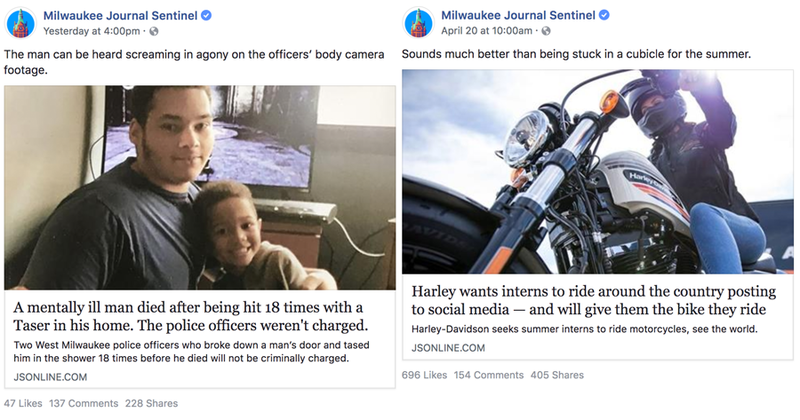 You can read more about the Journal Sentinel's social strategy, which helped us grow our Facebook reach by six times in a year, in this article I wrote or listen to me talk about it on the "It's All Journalism" podcast. I do the majority of the posting for the Journal Sentinel's flagship accounts on Facebook, Twitter and Instagram. On Facebook, we post just our best content. We're focused on sharing stories, images and videos that our audience will engage with and want to share with their friends and family. Presentation is key, so I often rewrite headlines for a social audience and swap out promo images. 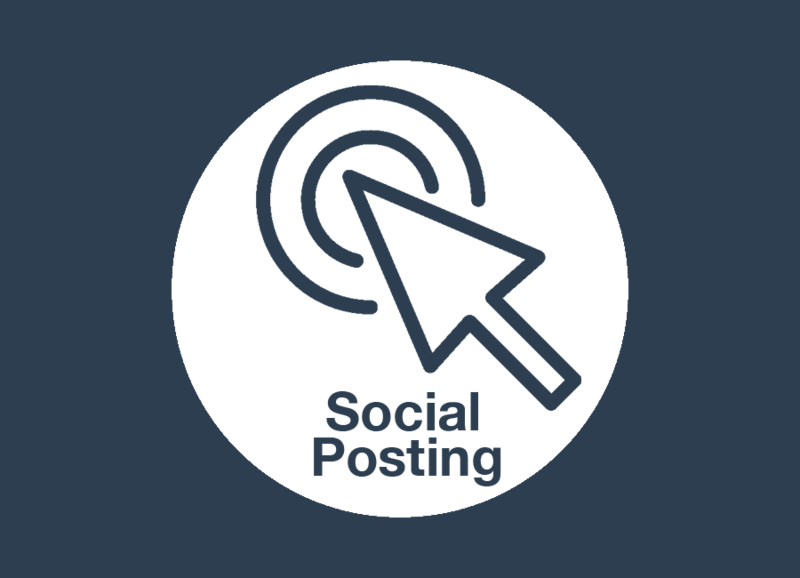 On Twitter, we're always looking for ways to be creative and stand out in people's feeds. One way is with threads, which also allow us to provide additional context and link to more content. And sometimes, we have a little fun, like we did with this thread of archive content on the Famous Racing Sausages, who appear at Milwaukee Brewers games. On Instagram, we of course post our best photojournalism, but we also look for ways to introduce the younger Instagram audience to our signature journalism. We've found stories to be a good way to promote content aimed specifically at that audience — like Be MKE, our newsletter aimed at young adults living in the city — and to promote other content we think that audience will connect with. Here's an Instagram story on Vel Phillips, a pioneering feminist we knew our Insta audience would love. And here's an Instagram story promoting an exclusive interview with NBA player Sterling Brown about his arrest and tasing by Milwaukee police. I developed the mobile and desktop push alert strategy and styles for the Journal Sentinel, including introducing twice-a-day "story of the day" alerts for our best enterprise content. Our alerts are conversational and engaging.